Ok so I'm super excited about the chance to put forth a new idea for a commander. I won't ramble on but I am a bit salty as I think this is the perfect opportunity to give the USF a call in sniper unit. It's an addition that the entire USF player base has been wanting for a long time. Just my 2 cents this would have been the perfect time. So the USF is a pretty munitions heavy faction and while fuel is always important their need for munitions isn't really supported with the current commanders. The Indirect Fire Doctrine hopes to give the USF and option of embracing the munitions playstyle fully. The 0CP Toggle allows for USF forces to increase the rate of munitions and fuel weapon upgrades for squads, Recon Overflights, and Artillery call-ins. At 1 CP the commander gets access to the I&R Pathfinders which need a lot of munitions to function. The combo of the Toggle and IR Pathfinders should make for a relatively deadly commander. The third option I leave open. I think the AT Gun ambush is a strong choice giving the commander some much needed AT options but this can also be solved by the Ambulance Weapon Racks. My thoughts is the upgrade would convert the Ambulance into something like an M3 Halftrack with healing and weapon racks. The strength of the commander relies on the early game and maintaining units with high vet. At 4CP you get the Recon Loiter. This will help with scouting and locating targets for the 7 CP Artillery Call-in. This commander is the only USF commander to have a theme and truly stick with it through all 5 abilities. The theme here is munitions and lots of them. The lack of Fuel means that players who choose this faction will have to make smart choices for the few vehicles they bring onto the battlefield and keeping those units alive becomes even more crucial. Early game and mid-game this commander brings a lot of versatility and power. The combination of weapon racks, grenades, abilities like volley fire, and light vehicles like the M20 make for a strong start to the match. However if these advantages are not capitalized on the commander lacks elite infantry or vehicles to go blow for blow with the Germans. Your goal is to tip the Germans off balance with well equipped squads and then pound what's left into submission with 150mm Barrage!! You'll have to be careful for when you choose to use the 0CP toggle. At the right time it can see you blasting the opponent into submission but play it wrong and a Panther can hit the field while you have no answer! Theme: Combining elite armor army with well-trained american infantry with air support , this commander will break down enemy defence even if will be stopped for a time can be used as great for counterattack. "Vehicles and infantry within a radius of 30 ingame meters will coordinate together to improve their potency. Lasts 30 seconds,so time well." "A P-47 Thunderbolt will attack vehicles in the targeted area with its 5" High Velocity Aircraft Rockets." Makes USF attacking more different , counterattack better using all types of forces. ‘Easy Eight’ is a great medium tank and can help you you with fighting even more armored tanks , I&R pathfinders would be great for early scouting enemy positions and clear it with their artillery barrage , combined arms will connect all you forces , that makes your attack or counterattack more focused and better , M8 greyhound’s job is sqouting as pathfinders too but is more durable and safefull , even if enemy will call in for example pather you can use p-47 rocket strike to damage it hard or any other enemy heavier tank , use it when your Easy8s will fail . When used skillfully this commander will be great counterattacker/attacker. I was the most modeling in gen. Patton’s army at ardenem campaign from history. He used every force i give to that commander. Wow man , that is amazing !!! To eradicate unpleasant gaps in the USF army structure, this commander provides you with good area denial tools and special ambush units. Use your new toys to harass your opponent and bounce them off their comfort zone. No longer your enemies can afford to dig in key areas and bombarding you with their immense indirect fire options, until their big armor rolls out for the final blow. If you sometimes feel your opponent is leaning back, drinking coffee and watching football in television, while you struggle to fight back some ground, then this commander is for you. This company stands out due to general flexability and power against enemy fortification strategies. Choose this company to punish static play and force your opponent to move his units. Keep up the pressure and axis fanboys will actually have to do something in order to stand a chance. Description: Rear Echelons can get a medical support package and riflemen can upgrade to flame nades. M4A3 Sherman Medium Tanks can be equipped with light rocket launchers and M36 Tank Destroyers can be armed with flame throwers. Notes: Allows Rear Echelons to upgrade a medical package instead of mine detector. They will now be able to drop medkits (same like storm pioneers) and use passive heal ability (same like the british medic infantry sections). Allows rifleman to throw flame nades (same like OKW flame nades) after HQ grenade upgrade. Allows Shermans to upgrade to rocket launchers instead of their mounted MG. The rocket launchers are a lighter form of calliope rockets that are less damaging but provides area denial. The Shermans can not shoot their main canon or use other abilities during their rocket launch attack. Allows M36 Tank destroyers to upgrade a secondary flame thrower for better anti infantry capabilities. Description: A Supply Officer equipped with a sniper rifle can be requested to the front lines. This unit supports infantry in taking out team weapons and can trade resources for munition supplies. Abilities: Camounflage, Can call a munition air drop in exchange for other recources in friendly territory (at least 60 munition per drop in exchange for fuel or manpower). Notes: This unit allows the USF faction to be versatile, as allowing them to have at least one sniper in their army collection and should function like snipers from other factions, with the difference in the abilities reflecting a more supportive role. The ability for the munition trade fits nicely in this doctrine. Description: Elite infiltration troops who are experts at destroying priority targets behind enemy lines. These units can be deployed from any ambient building. Deployment: Call in unit, can also be deployed from ambient buildings. Weapons: Same starting weapons as rangers. They can be upgraded with either double heavy bazooka (same damage output and munition cost as panzergrenadiers panzershrek) or thompsons (same munition cost as rangers). Abilities: They have camouflage, they can plant demo charge, they can lay M20 anti tank mines, They have a phosphor grenade (which does damage over time and provide some smoke). Notes: This unit allows the USF faction to be versatile, as allowing them to have at least one unit in their army collection, which can be deployed from ambient buildings. Description: A light artillery barrage can scatter enemy forces. Notes: Identical to Ostheer Light Artillery Barrage ability. Description: P-47s will automatically recon and attack enemy units in the designated area. Notes: Same as OKW overwatch doctrine, sector assault. Instead of the dropping bombs there can also be P47 thunderbolt attacks. Important is the anti infantry and anti tank capability. USF´s early game can turn incredible fast into an uphill battle against a steadily stronger becoming opponent until a point of no return is reached, where no real counters especially to fortificated enemies with large indirect fire power are available. Furthermore it is no secret that USF lacks of some basic units in their army structure for example area denial tools, which can be good counters in these situations. This commander aims to close these gaps and make the early to mid game a little more forgiving as well as giving the USF player late game good options to compete with unit concentrations and obtain good map control. Incendiary grenades for Riflemen, which can force enemy units out of cover will give USF players the opportunity to trade evenly with axis infantry in the early game. USF Players can upgrade Rear Echolons with a medical package which gives a good alternative especially late game when many players struggle with their one shotted ambulance, their only way to heal and do not want or can not afford to rebuild it. The Supply Sniper Officer will be the first Sniper in the USF COH2 army. He will help early to late game against infantry and can support USF Players with special abilities as long he can be kept alive. Also USF Players can deploy new ambush elite troops to prevent enemies from becoming to comfortable and only looking what happens on the USF player side of the battlefield. These ambush units are versatile as they can upgrade to anti-tank or anti-infantry weapons. They have a demo charge to destroy little structures and can lay anti-tank mines. Upgradeable shermans with rocket artillery will give USF finally a basic reliable area denial tool, which can be used from late-mid to late game. These are of course no annihilation units but can slowly bleed enemy forces and damage structures, as axis and soviet players already do in many games. It also helps to move the opponent to a more mobile game and can break static formations. The same applies to the Light Artillery Barrage which can be used mid to late game as long as enough resources are available. These ability is also good to decrew static team weapons and destroying little structures. USF Players finally have an option to better protect their Tank Destroyers from infantry shrek rush or other threats as they can be upgraded with flame throwers, giving them a chance to not only survive but also punish infantry attackers in return. Finally as the lategame option USF Player have the P-47 Sector Assault which again counters static formations and supports the army with good counterattack assistance or can help defend the lines if the player has the lead. The downside of this doctrine is that it is extreme munition hungry but when used skilfully USF Players will have a fair answer to almost every situation. I did not make this commander historical accurate. I put it together from a tactical and strategical view with the already known abilities in the game in mind. Thus I think from a historical stance it is okay, because I have not put unbelievable things like giant jumbo shermans with 4 cannons or similar stuff in this commander doctrine. If you want some lore for the Special Forces I read something in wikipedia about "First Special Service Force". I also believe that a sniper for USF would be a cool thing which many USF Players want to play. In my opinion this commander has everything a good company needs for 1vs1 up to 4vs4 battles (good early, mid and late game abilities). All costs and other stats are only basic suggestions and are subject to change if the commander moves to a short list. Thank you Relic, Community and Dev Team to give us the chance to show our commander ideas. Slot 2: Field Defenses 0CP - Assault Engineers can also construct sandbags. Slot 4: QF 17-Pounder Emplacement 8CP - Can be constructed by Assault Engineers and Rear Echelons. This Commander aids USF defensive play. Field Defenses allows USF troops to always be in green cover. Assault Egineers can be used both offensively and defensively. In case of overwhelming enemy forces "Man the Defenses" may tip the scales to US favor. Thanks to QF 17-Punder even the most armored axis tanks won't be able to achive a breaktrough. Edit: M3 switched to Assault Enigneers, M4A3E8 to 17-pounder. M26 will cost the same as Wermacht Elephant. Theme: Fortify and supply your frontline troops with the special units and abilities of this commander without having to return to base. Same as Opel Blitz, it will have the ability to increase resource, however, this truck cannot reinforce squads, cannot get a machine gun, cannot transport a squad and the crew cannot disembark. The special feature of this truck is that it can carry Bazookas and BAR (and maybe M1919A6 LMG depending one what is chosen for slot 4) from your base sector and drop them to be picked up by your troops anywhere on the map. Can carry two of each weapon max. An interesting other feature might be to allow this unit to scavenge enemy dropped weapons (not crew weapons). It would pick them up by you selecting the unit and clicking on a dropped weapon, then returning to base and clicking a scavenge ability button. Perhaps you can gain half or a third of the munitions cost of the weapon. The only problem with this idea is the icons for the abilities, so it may not be possible. Same as other commanders, this ability is not critical, the first 3 are critical to this company. I’m not sure what to put here but every other commander, except Heavy Cavalry Company, has an offensive option to either bombard the enemy with artillery or strafe them with aircraft. This includes pathfinder and WC51’s abilities to call in barrages for their respective companies. So, I was thinking this commander should probably have such an ability as well. The ability I would choose, if it were artillery, would be Time on Target Artillery Barrage of the Infantry Company or what ever Dog Company had access to in Ardennes Assault since I think it would be best for holding the line if your troops are dug in with sandbags etc. I feel the US forces’ artillery barrages are lacklustre, though, but they have so much base strength to their army I understand why that is the case. If I had it my way I would get M4A3(76) shermans since they are just so badly needed on the front-lines. Panzer IVs strike fear into you since they are so potent on both vehicles and infantry, the M4A3(76) turns the tables and can decimate heavy armour if used right. When I recently got the Mechanized Company, I felt so relieved of stress that I had a 76 behind my troops when a panzer IV came along. I didn’t have such a great uneasy feeling of having to do some heavy mirco on a Sherman M4A3 to ensure it didn’t get decimated by the panzer IV (it’s not that bad but having a 76 really is a good feeling – that they should fear your tank instead). I don’t have the M4A3E8 commander to know how it performs, but either way, if we did offer tanks we could call this “Mechanized Support Company”. I also figure a Jackson tank destroyer, with its range, would be able to better support your troops at frontline fortified positions compared with the tanks. So, the tanks may not be the right fit in that case. I honestly would prefer an M10 with better range and slower turret movement. As far as I remember its turret moves extremely slowly (the real M10) but it was made in this game as a flanker for some reason. The US forces are very well matured now since the latest changes but they still lack one ability and that is to get their weapons (Bazooka and BAR) to the frontlines. If you gain a foothold and place sandbags and fortify yourself, at some point light vehicles and half tracks are going to come at you and the only option for US Forces is to run all the way back to base if they want to utilise a bazooka. It does often happen that you do end up and base in the normal flow of combat but even then you may defer moving your troops up and wait for munitions to get that additional bazooka or BAR equipped. Yes there is the Lieutenant and Captain but they are just one squad. This is an unfortunate problem with the US Forces, if you get a hold on a position you can’t often maintain a hold when the vehicles come. Other armies can simply get their upgrades in the field or for the British they can build a forward assembly close to the frontline to allow their troops to gain weapons close to where they are fighting. This same ability for weapon racks does allow the US Forces to be more modular and versatile/adaptive on the other hand. The ideal case would be to allow your Riflemen and officers to have some way of getting their weapons on the frontline where they have already dug in. This is where the WC51 Supply Truck comes in and I’d prefer it came earlier at 2CP rather than later at 3CP but the Opel Blitz comes in at 3 CP. The US Forces do have access to forward reinforcement and healing via the Ambulance which is another strength, on top of modularity. The problem with that vehicle, of course, is that, even though you can get your medics to disembark, neither the vehicle nor the medics should be anywhere near the front lines in the ideal case. This is where the M3 Half-track comes in. It has good armour, can reinforce troops and drop boxes for healing. This will help your troops hold that frontline position, by giving reinforcements and healing them up without such a high risk of losing your vehicle as there is with the ambulance or them having to abandon their position in order to get to where your ambulance is (typically far from the frontlines). If you do have to fall back from your frontline you can get the troops back up there quicker with the half-track and keep up better as the frontline moves deeper into enemy’s side of the map. At the same time the ability for the WC51 Supply Truck to increase resource will help counter balance the cost of getting the M3 Half-track, even though it isn’t a lot of manpower, but the fuel cost and the cost of dropping crates do matter. I like to save all fuel (other than racks and ambulance, sometimes frags are necessary) for getting shermans as soon as possible. Maybe I underestimate the lighter vehicles but I feel like I have no time for something that will just get destroyed super quick and cannot scale later into the game with it’s veterancy. This may be due to me preferring annihilate games also. The whole point of this commander is to allow your troops to hold the line i.e. they capture a point somewhere in the middle of the map, sandbag in and they can stay put and use their sandbags, rather than abandoning them to go and get the critical weapons they need (or healing), all the way back at base. The Mechanized Commander helps with this problem with its WC51 trucks allowing you to transport your troops back up to the frontlines quickly. The M1919A6 LMG and Riflemen Flares, I imagine, would be useful on the frontlines also. I do use the LMG but not that much, and I it seems to behave more like an MG42 (in the hands of riflemen) even though it says it can fire on the move (though paratroopers could fire on the move from what I saw). If it is anything like the MG42 it can be a great frontline support weapon that can keep infantry at bay at long ranges. Riflemen flares could be used instead to periodically illuminate the battlefield to be able to better prepare your entrenched troops to any threats that may be coming. Field guns are always good to fortify frontline/entrenched positions so ambush tactics could be useful in this slot. For the slot 5 ability, I offered a discussion for it under its respective slot for the “Unit and Ability Roster” section. It is not critical to this commander, though I really love the upgraded shermans. You can rationalise this commander having access to these in demand tanks by saying that your company, through its strong supply ability, is able to get new and advanced weapons out on the field fast and has the latest and greatest weapons available, including the M1919A6 LMG (if it were chosen for slot 4). 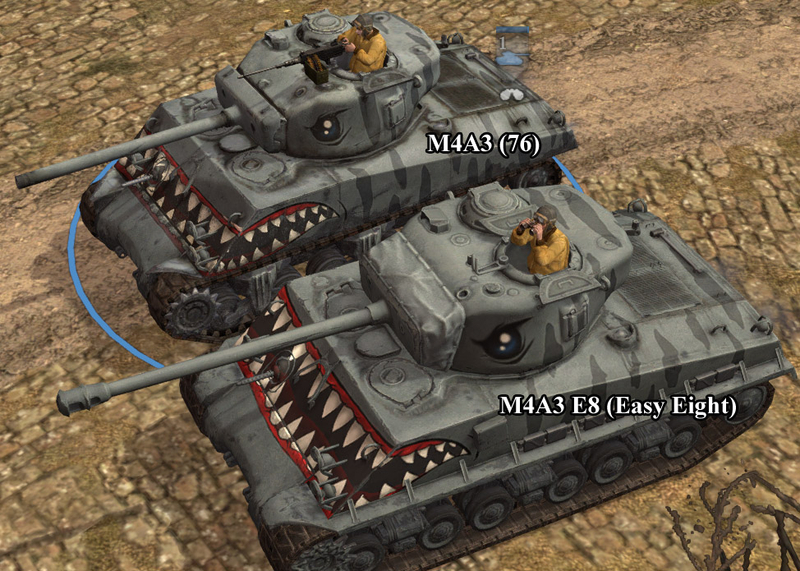 From using the M4A3(76) in its latest iteration, I would love to have another commander with access to them and another commander I can use to keep the frontlines manned rather than having troops just hanging around idle in base. Did US Forces not have strong supply facilitated through a vast array of vehicles/mechanised units? Not exactly a rhetorical question, I’m not an expert on the history. 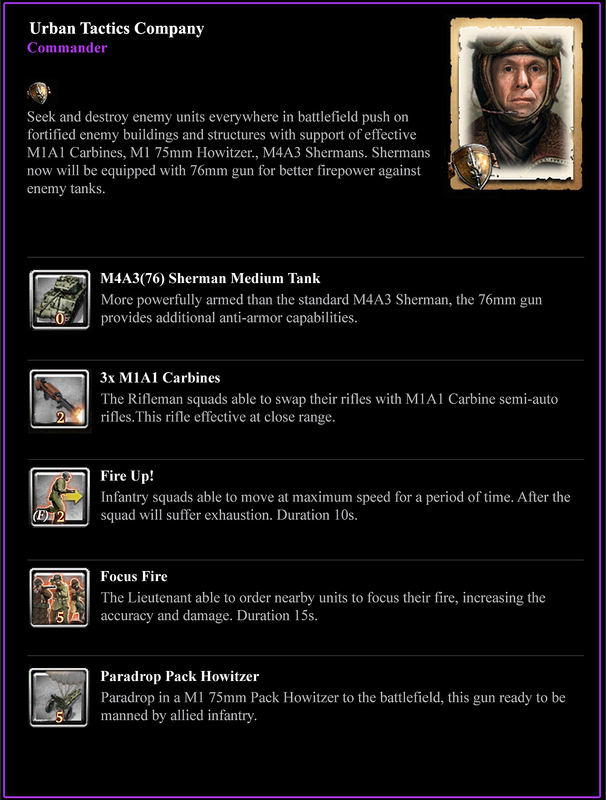 An incendiary-laden company with a heavy anti-infantry and anti-static focus that helps munition-favoring playstyles to force Axis to be persistently cautious of their positioning, and to be always ready to move; This company rewards the aggressive with strong early and mid-game punch, while in late game giving tools to break siege lines and any silly notions of a relaxed defense. Slot 4 - "Sherman Crocodile" can be called in to the field, replacing the coax of a M4A4 Sherman with a flamethrower, while mediocre against vehicles, it burns enemies out of hardpoints and clears weapons teams so riflemen can advance! Slot 5 - "Firebombing Raid", Similar to the UK bombing run, this opts instead for a trio of bombers, after a delay, to fly in formation to carpet bomb a wide, aimable line with incendiary bombs to deny ground, and to punish static emplacements and infantry caught in it's path of destruction for a high munition cost. Three passes will bath the area with bombs that do low explosion damage, but burn in a wide area to 'discourage' opponents from moving through the targeted zone. Used in game units which is could be seen with all units mod. Wanted set a US commander more aggresive and with better tank support . 3x M1A1 Cabrine upgrade costs 45ammo This rifles will not effect to weapon slots just swapping standard rifles. Also dosen't need to go back base to take. Good in short distance. Use your paratroopers to clear enemy defence from behind . After getting on that place from front way , M5 Halftrack will be great option to complete your paratroopers squad to full , additional you can carry them after capture and send them quick to any other important place , and gives good firepower a specially versus aircraft when properly upgraded . Your air forces gives you two more ways for help from the air : the first one is sqouting that helps you later to plan front attack or send down your paratroopers . The second one is more agrresively option but could be also used as defence ability : help your paratroopers when under fire , clear enemy largest group of infantry or enemy mg . Even if enemy frontal defence will be too hard for your medium tanks , call in m26 Pershing heavy tank , that will break their defence line. That commander offers you always two different ways to beat enemy , for example capturing point . You can do it by frontal attack where M5 Halftrack will support your infantry when M26 Pershing will ruin their defence OR sneeky attack from behind using paratroopers with air support , that is always your choose. Also , you can use both tactics . Commander offers you new look on the Battlefield , additional he is the first commander conntecting that big ground and air forces at that much scale. Why would i like to see this commander in gamę? : USF is very universal faction , so i think that two-option commander will give more options to experiment with two different ways. The big advantage is you can choose which tactic you will use correcty to the situation on the Battlefield . I think that commander will bring a lot of experience and fun. Often used tactic in US army was to mąkę two fronts and later by pushing connect they in one point , completely destroing enemy army from two fronts a specially at Ardennen Assault . In my opinion that historical curiosity will help you to understand that commander better . All CP values remain at their current settings. Contexts and rationales have been thoroughly explained by me in other threads so, I'm not going to repeat them here. Slot 4: AB Engineers (3 CP): New unit. -Drops regular "stick" of paratroopers. Emphasizing speed, firepower, and battlefield awareness, this Commander understands that the German Panzers will attack where the defensive line is weakest. Instead of attempting to weather the Blitzkrieg with a static defense, German Armor will be encouraged to over-extend their armor where it can be attacked from the sides and rear by the M10 Tank Destroyer. When counterattacking, Cavalry Scouts and M8 Armored Cars are able to move unseen through the German lines. American tanks struggle against the best other nations has to offer. However, instead of increasing the potency of the anti-tank units available, this commander increases the quantity, allowing USF players to attack the rear armor of tanks more often. Additionally, USF forces gain increases strategic mobility by giving stealth abilities to more types of unit and an increased focus on fast vehicles with light armor. The ability of camouflaged units to scout enemy positions before committing their light armor to offensive actions allows these inexpensive units to punch above their weight, in line with the existing USF doctrine: mobility and adaptability. American tank destroyer doctrine and motorized reconnaissance units combine with this Commander. Historically, American Tank Destroyer Doctrine stressed the use of weapons systems like the M10 GMC, M18 GMC, and M36 GMC as reactive weapons intended to attack German armored units that had already broken through the front line. When on the offense, American doctrine emphasized the concept of Air-Land-Battle. Reflected by increasing the USF’s potential for reconnaissance, this allows players to coordinate the full power of USF’s firepower against weakness in the German defensive line. Call in unit, available from 9 CP. A unit with stats identical to the USF Pathfinders, but comes equipped with two Bazookas in place of their sniper rifles. [Identical to the German counterpart] HMG teams, Cavalry Scouts, and Rifleman can upgrade camouflage, giving them the ability to conceal themselves when in light cover, light cover, or deep snow, making them invisible to enemy units. When attacking an enemy unit, the squad will break camouflage and do more damage for a very short period of time. "The M8 Greyhound is a fast armored car that can tackle light vehicles its 37mm main gun. Its canister shot is able to decimate grouped infantry. Effective against light vehicles. Weak vs. tanks and anti-vehicle weaponry." All vehicles with the M2.50 gain access to armor-piercing ammunition, increasing their damage against light vehicles. Theme: This command brings an Elite selection of units, handpicked, the best units available to fight for your front, whever you’re the type that wants elite riflemen moving around in jeeps releasing havoc and having the most elite Rear echelons armed to the teeth, capable of dealing with armour and foot men or the type that enjoys sneakily hiding behind enemy lines with snipers, or do you just enjoy running head on into the enemy using the Easy 8 Jumbo? This command brings everything an elite company could need to the front lines. • Call in unit available from 1CP. The USF don’t have a very strong hold against their axis counter parts, they lack the man power, equipment and early and late game advantages their enemies have, which is why in this company the USF get their elite troops, capable of handling early and late game problems. The fact that the Americans lack Sniper is very annoying as well as the fact that a heavily armoured point is destroyed by 2 German mortars, so this company brings in a sniper from their British allies to be under your command, use him to slow enemy advance and keep the mortar spam at bay. The USF also lack well armoured vehicals, this is why you can bring in an easy 8 with this company giving you a bigger chance against axis armour late game. The ELITE Rear Echelon are armed for any job they are given, wiping out blobs of panzer grenadiers and taking on light armour, will cutting away at barbed wire and tank traps. USF used snipers in the real war, so the fact that the game does not have them is quite annoying, snipers were used in a few fronts with a few roles but I still think this matter deserves attention even though they were never really used they were still there. theme: Use your combined mobility forces to dominate enemy . Calvary riflemen will clear close enemy infantry , M5 Halftrack will support them while on the battlefield will arrive light and fast M10 'Wolverine" helping you with enemy armor and M83 cluster mines if you need to can still beat enemy infantry blob. tactics: your advantage is early game , try to make m10 as fast as you can , it will help you to fight first enemy armored cars , calvary rifleman with fire up ability and posibility for thompson upgrade makes them very fast and deadly unit versus infantry , use them to quickly sneek and destroy enemy infantry before they will keep the best places as camps. M5 Halftrack can be great support on the battlefield for your calvary squad because you dont need to retreat to base , so complete them near the front and dont give your opponent any short time of rest. M38 cluster mines are a great ability to completly ruin the enemy infantry blob , use thes defencibly or to clear enemy buildings that you couldnt even get. -For the defensive playstyle I wanted to give the standard infantry the defensive options they need to support this playstyle. So they can be defensive with sandbags, mines and firingpits. -Instead of the aggressive bars you can pick up the static shooting M1919A6 to improve your defensive play, but decrease your mobility. -An ability from the Ardennes assault DLC. A Thunderbird fires his rockets in a strafing run, similar to the strafing run of the tactical support company. Meant for defensive but also as an offensive attack. Can clean up heavy fortification, destroy bunkers and block roads. It can also provide cover to your infantry. In the current commander roster the USF lack a more defensive option. Early game rifleman are able to bolster their positions using the rifleman field defences ability giving them access to sandbags, mines and firingpits. Instead of BARs the M1919A6 Browning LMG can be equipped for more firepower from defensive positions which, in combination with Man the defences, enables the USF to hold a line where they otherwise would need to fall back. The bulldozer Sherman is able to create new defences or destroy obstacles while providing a more bulky tank to push the frontline. At last you can call in a rocket strike at a designated target to chase away the heavy German armour. Has the same idea, just a less powerful flyby and more against infantry. A fun change in the commander for extra firepower, doesn’t fit as well in the commander as the bulldozer but surely a nameworthy option. A friendly cargo plane will drop crates of fuel at the target location. Vehicle crews gain Thompson submachineguns, increased repair rates, and faster veterancy. A mortar half-track gives constant mobile artillery support to the frontline, able to maneuver at will to keep the push constant. A squad of Cavalry Rifleman arrive in an M3 Assault Half-track, ready to leap into combat. The Super Pershing combines the experimental T15E1 90mm gun, able to pierce the armor of any tank, with American ingenuity, in the form of tearing off the armor from a destroyed Panther and strapping it to the front of the tank. Combined, the Super Pershing can take on any armored opponent, confident in both firepower and protection. Based on the 3rd Armored 'Spearhead' division, this is intended to be the American armor doctrine without just throwing cheap Shermans into the line. This doctrine focuses from the start on vehicles with an early crew upgrade and plentiful fuel, along with a mortar and mechanized infantry to focus on combined arms. The final Super Pershing provides the Superheavy tank that the American are lacking, and it's fitting as the 3rd Armored was the group the T26E4 was deployed to. Checked the threads and saw that the sticky threads have changed. Reposting my proposal in this thread from the previous one. Hope it does not break any rules. Thanks. Theme: Company that has seen much action in the war and has adapted to harsh conditions of front line combat. Utilize infantry and support weapons team bonuses in veterancy, mobile Rangers squads and off map White Phosphorus barrages. Rear Echelons at Vet1 get the ability to upgrade 3x scoped M1 carbines (increased sight range), Vet 2 Combat Medics upgrade (unit can heal outside of combat and heal other squads at 20 munitions) Vet3 light camo*. Rifleman at Vet1 gives a bonus to rate of fire and reduced weapon reload time, Vet2 gains access to Riflemen Flares and Vet3 Fire Up ability (maybe a slight reduction in received accuracy to make them more durable if not too powerful). Rangers at Vet1 get received accuracy decrease, Vet 2 increase grenade range and Vet 3 Fire Up ability. Lieutenant, Captain and Major can upgrade squad members to Specialist (or just keep the models the same) at Vet3 which increases sight range and gives squad members carbines for increased rate of fire. 81mm Mortar crew: Vet1 -25% received accuracy, Vet2 50% reduced setup and takedown time, Vet3 passive "drill team" which markedly increases rate of fire. M2HB .50 cal Machine Gun Team : Vet 1 increase to weapon range, Vet 2 decrease to weapon cooldown, Vet 3 light camo*. M1 57mm Anti-Tank Gun : Vet1 increase rate of fire, Vet2 increased sight range when set up, Vet3 light camo*. M1 75mm Pack Howitzer Crew: Vet1 -25% received accuracy, Vet2 access to "Creeping Barrage" ability, Vet3 passive "drill team" which markedly increases rate of fire. light camouflage gives the unit the ability to be invisible in light and heavy cover (except for in buildings and fighting positions). Has a slightly longer detected range than a sniper for example. great for setting up ambushes. As a support unit the benefits at each level of veterancy for the Rear Echelon upgrades seem natural and self evident. Riflemen are already an all around a solid front line unit, the bonuses should give the squad more maneuverability and survivability. Riflemen excel in engaging tactfully and in numbers. As veterans Riflemen should be capable of using every tool available to tackle the enemy, which is why the unit should have access to all possible upgrades. Rangers are true and gritty veterans of combat, upgrades to the unit should reflect on that. Squads need experienced soldiers to keep the officer alive. Increased line of sight and extra firepower should give the commander more time to react to oncoming enemy forces. Support Weapon crew benefits are designed to give an immediate but not too strong bonus to the unit that will carry them into Vet2 and eventually to Vet 3 where the squad is capable of giving efficient support. Submissions are now closed. Thank you to everyone who has taken the time to post their ideas. The Balance Team will now be assessing the best proposals for the next stage of this update.